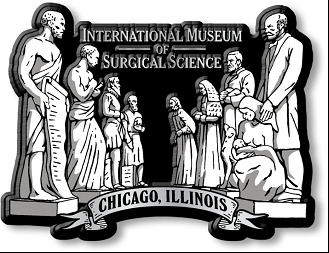 Take the International Museum of Surgical Science home with this new molded Museum Hall of Immortals magnet! The magnet features a metallic silver finish. Medical artifacts, apparatus and instruments comprise the bulk of the material in the Museum’s collections. Over 7,000 medical artifacts spanning centuries of worldwide medical history, from acupuncture to X-ray therapy, are represented in the collections. Fine art is featured in the collections through over 600 paintings, prints and sculptures, primarily portraits of individuals and historical depictions of specific procedures or events. Significant artworks were commissioned by the Museum for the collection in 1950-53 including the Hall of Immortals. The Museum’s Hall of Immortal statues are attributed to sculptors Louis Linck and Édouard Chassaing, commissiones for the Museum in 1953.